The other night, while working on one of the purses, I was thinking that I should collect up a bunch of small fabric scraps and make yo's yo's. Now, I've never made one, but I've seen directions and, other than it looking time consuming, seems pretty easy. Think they might be cute sewn onto a purse with a button or a bead in the middle. AND THEN, I stopped by Grans to drop off the clothes that Lilly has outgrown and, of course, had to go in and take a quick look-around. 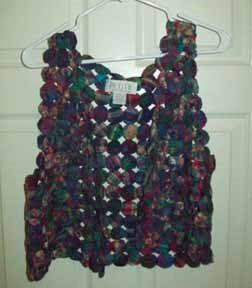 AND THEN, there it was .... A YO YO VEST. And, it was only $2.00. Now, that seems a whole lot less time consuming than making my own Yo-Yo's. What a deal. I'll set some time aside (a good TV activity) and seperate these for use.